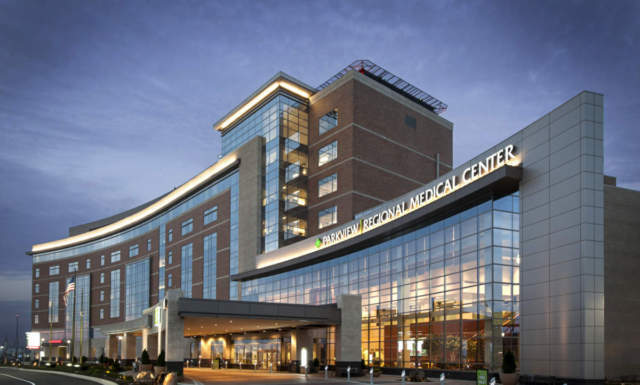 In the largest construction project in the region since the General Motors truck plant was completed in the mid-1980s, Weigand was selected as a lead contractor for the creation of Parkview Regional Medical Center (PRMC), a 1,000,000+ sf, 115-acre campus on the north side of Fort Wayne, IN. To maximize the efficiency of the Parkview staff, a major emphasis was placed on the integration of technology and patient care flow, as well as physician and family access, into design and construction. In addition to the 446-bed hospital facility, the campus also features specialty centers for heart, cancer, and orthopedics, a conference and education space, and physician office buildings. The nine-story Parkview Regional Medical Center tower houses emergency, acute and critical care services. Additional services are also available to support inpatient care, such as imaging, pharmacy, laboratory and more.